G. Bryan Slater was appointed by President Donald J. Trump to serve as the U.S. Department of Labor’s (DOL) Assistant Secretary for Administration and Management in October 2017. Prior to his role as the Assistant Secretary, Mr. Slater was appointed by Secretary Elaine Chao and approved by President Trump to serve as the Assistant Secretary for Administration at the U.S. Department of Transportation (DOT). At DOT, Mr. Slater managed all facilities operations, acquisition, human resources, security, Working Capital Fund and operations activities at the Department. In his role, he was also instrumental in driving the development of key priority government reform goals, including launching the Department’s enterprise/shared services program. Under President George W. Bush, Mr. Slater served as the DOL White House Liaison from 2005-2009 where he built the relationship between the White House Liaison Office and the Department, as well as developed and directed the human resource functions and operations for more than one-hundred and fifty appointees. Mr. Slater also served under that Administration as the Deputy Associate Administrator for Intergovernmental Affairs for the U.S. Small Business Administration (SBA). 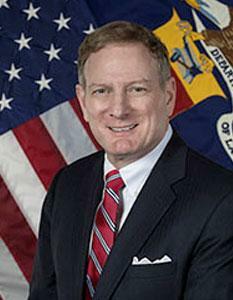 At SBA, Mr. Slater developed and implemented SBA’s Alternate Work Site Activation Program — a national pilot for new satellite offices that successfully placed resources closer to the agency’s client base to maximize efficiencies and cut costs. Under President George H.W. Bush and former Secretary Jack Kemp, Mr. Slater served as a Congressional Affairs Representative at the U.S. Department of Housing and Urban Development (HUD). A Virginian, Mr. Slater has held several leadership positions within State Government in the Commonwealth of Virginia, including as the Secretary of Administration — a member of the Governor of Virginia’s Cabinet and as the Director of Administration for the Office of the Attorney General. As the Secretary of Administration, he oversaw fourteen state agencies and approximately twenty boards and commissions on a variety of service areas, including: operations, human resources, elections, general services and veterans’ services. As the Director of Administration for the Attorney General of Virginia, Mr. Slater directed daily operations of over three-hundred staff and successfully relocated operations from three separate locations to one on-time and on-budget. Mr. Slater is a graduate of University of Richmond and Ferrum College.